One of Tauck’s unique features is that for many of their River Cruises they include time in hotels before and/or after the Cruise as, if there’s a city that’s a can’t miss, they want you to see it since you’re flying all the way to Europe… most other companies offer these stays as optional add ons (some with hefty prices) so their up front price looks lower but due to that many people miss time in these great cities & lose out on the experience! So for example, on top our 7 night “Blue Danube” River Cruise itinerary, Tauck also included in their price 2 nights in a Budapest Hotel & 2 nights in a Prague Hotel… both epic cities that are not to be missed! And another great thing about Tauck is they have a “Welcome Dinner” on most itineraries… this was our 14th River Cruise and for all of our others where we started in a hotel we received a package at check in and were told “see you in the morning” which means enjoy dinner on your own tonight. 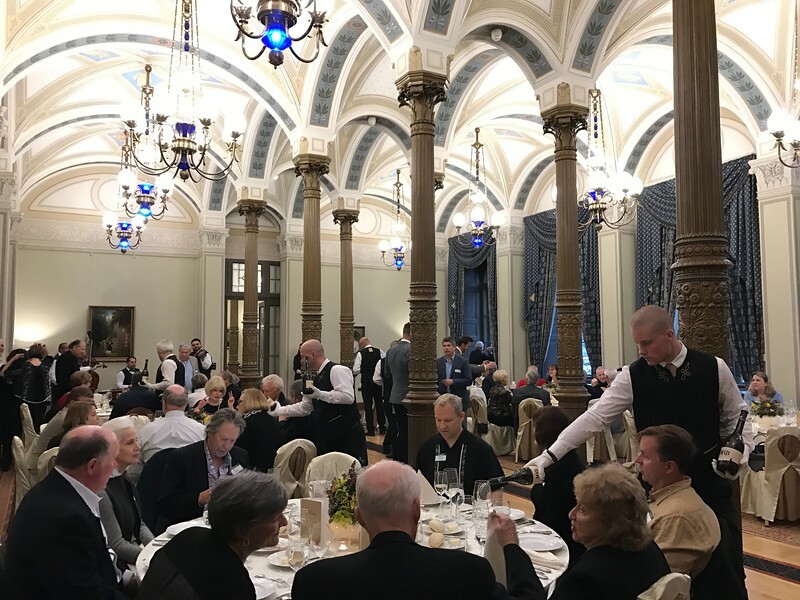 But Tauck was much different, they treated us to a spectacular private dinner at the “Akademia Club” in Budapest where we experienced great food, great service & fabulous music at a top notch riverside location. (Check out our venue above!) It was truly a great way to start our journey and a nice way to meet fellow travellers night # 1… the best welcome for any of our river cruises so far!